This body lotion has an exotic fragrance of ylang ylang from 100% naturally pure, organic aroma oil. A high proportion of Ayurvedic herbs such as sandalwood, Indian fig tree, sappan wood, beauty berry, vetiver and water lily offer many positive and naturally pure herbal active ingredients. Our body lotions are not superficial moisturizers. They contain a significant quantity of herbal ingredients that have a penetrating, cumulative effect, helping to nourish, balance and protect your skin. Renowned cooling Ayurvedic herbs such as Sandalwood, Sacred Fig and Blue Water Lily continue to perform their magic long after you've left the shower. Plus, restorative vitamins, antioxidants, and the rich essential oil of Ylang Ylang help support healthy skin cell growth and keep skin looking and feeling soft and silky. Unlike other moisturizers that contain harsh chemicals, our lotions work gently, yet effectively, so you can smooth them on day after day, year after year, for silky-smooth hands, feet and body. This body lotion has an exotic fragrance of ylang ylang from 100% naturally pure, organic aroma oil. A high proportion of Ayurvedic herbs such as sandalwood, Indian fig tree, sappan wood, beauty berry, vetiver and water lily offer many positive and naturally pure herbal active ingredients. BDIH seal for certified natural cosmetics. 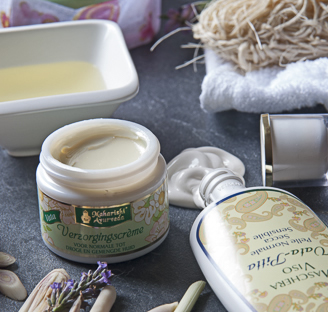 Made from natural oils and carefully selected ayurvedic herbs. Apply this luxurious silky lotion after bath or shower for day long comfort.